I made lots of quilts in the good old days of hand piecing, hand quilting, and squaring up quilts to get nice straight edges. I still enter competitions where wavy and curvy edges are a reason to get a ding from the judges. They write "Edges should be straight"! Ah, but on art quilts, you have the freedom to do anything you want. So, now after I square up my art quilts, I take the rotary cutter and purposely make wavy and curvy edges. This is so freeing! 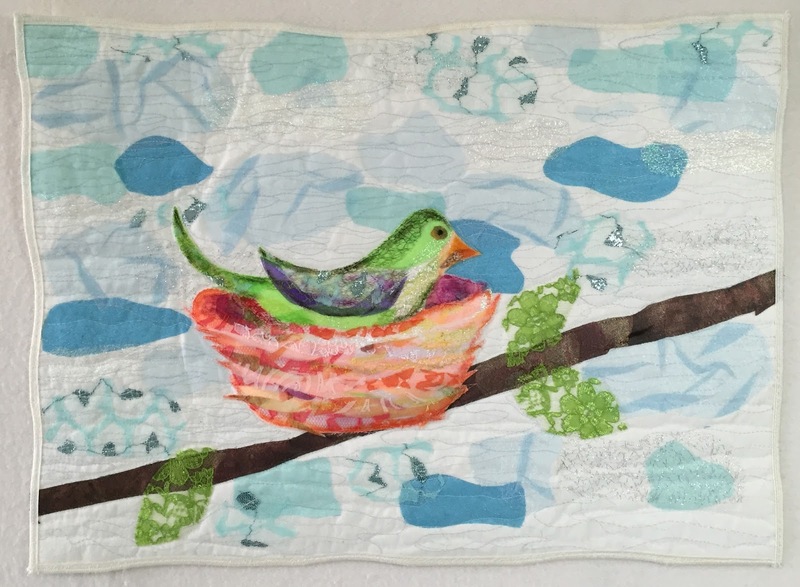 Some of the arts quilts in my nest series have traditional binding; some have facings; and some have couched fibers on the edges. All of these edge finishing techniques work on curvy and wavy edges. Jean Wells wrote excellent directions in her book, "Journey to Inspired Art Quilting", about how to add 1/8" grosgrain ribbon to the edges of an art quilt before you add the facing. This is great advice, and I encourage all of you to do this to stabilize the edges on wavy and curvy art quilts. Just one thing that I have discovered - for me anyway - is to keep the corners pretty close to 90 degrees. It's so much easier to turn the facings and make them look nice. The bird and nest were drawn by Esterita Austin during a workshop on using sheer fabric.